It’s fast, it’s fun…it’s awesome. Water Polo may just be the sport you have been looking for, a sport that can take you from junior right up to adult life. A sport that you can continue to play through college or University, even to the highest levels internationally…or just because it’s GREAT FUN. Would Water Polo be the sport for me? 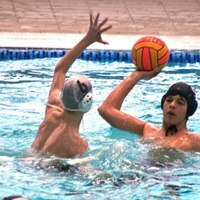 Both boys and girls play Water Polo, the training sessions are open to all ages with players split into groups according to their abilities. Teams are mixed between boys and girls up to the age of 16. There are coaches and older players to show you the basics, supported by team play with friendly and competitive matches to suit all levels. Our online Membership system has been renamed LoveAdmin. Please logon and check the details for you and your family as soon as possible. If you need any help please then contact the Membership Secretary. Our water polo sessions are held at Orford Jubilee Hub, on Jubilee Way, Warrington (behind the new Decathalon store) and at Lymm Leisure Centre. Our locations can be found by clicking here.